Daisy Chain provided an excellent base for our extended family gathering. The house is modern and well equipped plus it had lots of childrens toys that kept my nephew and nieces entertained for hours! The estate felt very safe and we enjoyed making use of the pool and spa facilities. Bike hire was straightforward and it was easy to explore the local area. We are already discussing returning in the summer. The weekend at the end of half term (30th October – 2nd November) is available if you'd like to enjoy Daisy Chain too! Contact Naomi on info@cotswoldfamilyholidays.com for more details. A beautiful sunset photo today sent by our guests who were staying last week. This sunset is taken across Flagham Fen on the Lower Mill Estate (the lake which is home to beavers). The visitor centre houses a great cafe which serves home baked lunches, cakes and afternoon teas. Photo via Batsford Arboretum on Instagram. A beautiful sunset photo today sent by our guests who were staying this week. This sunset is taken across Flagham Fen on the Lower Mill Estate (the lake which is home to beavers). There have been some beautiful sunrises and sunsets this week. This coming weekend, sees the return of the Northleach Steam and Vintage Show plus Ale Festival. 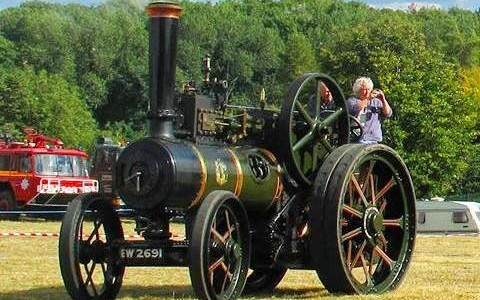 A lovely traditional country steam show, in the heart of the Cotswolds which makes a great venue for a family outing with something for everyone. On display there will be full size steam engines, as well as scale size steam engines, vintage tractors, classic cars, vintage motor cycles and vintage military vehicles. The organisers are keen to share the past with the children of today, so there is no charge for children, whilst adults are £5. Now is the perfect time to go blackberrying and enjoy collecting nature's harvest. Blackberries are ripening by the day. Why not go out with the children and enjoy collecting them. Don't forget to find a long stick so that you can pull those really juicy ones down which are otherwise out of reach! There are plenty of blackberries to be found on the Lower Mill Estate by guests staying at Daisy Chain. How do you eat your blackberries – crumble…pie or something else? A sunrise from the archives for you this morning – this sunrise was taken in August last year from Daisy Chain on the Lower Mill Estate. Treasure Trails are a fun and exciting way of exploring new areas. A number of treasure trails have been set up in the Cotswolds at locations including Cirencester Old Town, Fairford, Bourton-on-the-Water and Lechlade on Thames. Treasure Trails offer a great way of discovering some of the most beautiful and historic locations in the Cotswolds while making sure that children are fully engaged! Professor Corin Neeyam, curator of the town museum, has uncovered a plot to destroy priceless artefacts (as yet unveiled to the public), held in vaults deep below ground. Can you help to stop their destruction? Solve the clues to deactivate and protect the town's heritage. The Trail takes you from the Market Place in the centre of Cirencester where you can admire some of the most historic and scenic parts of the town, before heading for the former Abbey grounds. This makes a perfect place for a picnic before the Trail brings you back to the parish church. This Trail is approx. 2 miles long. There are lots of other Treasure Trails available so why not check if there is one for where you are.